Check out product summary table of best power banks in 2018 or the table of contents below to pick out the best power bank in the market. What power bank to buy? We understand that making a perfect choice based on your needs can be overwhelming when it comes to best power banks in the market. So to make things simpler, we have handpicked the best one for you. For summary of reviewed power banks, check out the product summary table. Manufacturers of smartphones, tablets, and media players are constantly trying to make better products with extended battery life. But, no matter how hard they endeavor, our ever-increasing use of these gadgets will continue to outstrip their battery life. That’s where power banks come to the rescue! Power banks are special portable batteries designed to take up and store electrical energy. At a later time, this electrical energy can be used to charge smartphones, media players, and even tablets. However, there can be unnecessary obstacles and disappointments in this rather simple process if you haven’t invested in a high quality portable charger. To save you the hassle of what power bank to buy, we have rounded up the 16 best power banks available on Amazon and explained in detail the pros and cons of each. But, before we jump into the specific details of each one of the power banks, let’s have a summary of our roundup. Let’s have a review of each power bank in detail. Anker has answered all your wishes for a lightweight power bank for mobile that is equipped with massive battery capacity in this brand new unit. We do not exaggerate when we say this conveniently portable power bank will last longer than you expect. The unit is supported by 18 months warranty and responsive customer service by Anker. This is a highly recommended mobile power bank for all those struggling to keep their phones alive throughout the day. PowerCore 20100 is a lifesaver for times when you’re out on an excursion and can’t be in the vicinity of a wall power outlet. Once sufficiently recharged, leave it to PowerCore 20100 to keep your mobile devices up and running smoothly for a couple of days or even more! RAVPower keep their word when they say ‘smallest but powerful’. Luster Mini 3350 is quite handy because of its lightweight and compact, cylindrical design. Here are some of the features of this incredible power bank. All in all, it is a great power bank for smartphones; light in weight, compact in design, yet high-performing in battery capacity. Luster Mini is a power-packed battery bank that takes up only a minimal amount of space among other mobile accessories but serves greatly. It can very well make your smartphones last a couple of days longer without a wall charger. Powerful and portable, unfortunately not pocket-sized, this battery bank for mobile devices happens to be a useful item to carry to your travels for charging three smartphones and/or tablets at a time. Six and a half inches long by three inch wide and an inch in thickness. Even with the slightly heavier weight, it makes for a pragmatic addition to your backpack because of the high battery capacity. This is a slightly heavier and larger alternative to the average wall charger, but certainly more powerful and convenient when you have to suffice without wall power outlets for 3-4 days. The power bank is absolutely safe to carry in a bag. Jackery Mini Premium is designed to live up to your expectations from a powerful and compact portable power bank. It is one of the best power banks. Jackery has manufactured and is sure to extend your phone’s battery life while you’re on the go. This is a handy power bank to carry around in your pocket; one that will serve you hard and fast. This premium quality small powerhouse is as handy to carry around as a lipstick! And while it is compact in size, it is mighty in battery capacity and use. This is one powerfully and beautifully built power bank highly adequate for carrying to a trip and keeping your smartphone(s) charged and working. There’s little more to be asked for from a power bank this compact in size. In my opinion, the size of the power bank serves its purpose quite well. Astro E1 fares just as well as advertised. It’s another Anker power bank that won’t disappoint you and juice up your smartphones a good many times on your travels. Anker’s PowerCore 10000 is by far the most popular and among the best power banks available on Amazon. It is one solid, concise, and super powerful answer to the question of what power bank to buy. The portable power bank comes with a Micro USB cable, travel pouch, welcome guide, instruction manual, and an 18-month warranty. Anker PowerCore 10000 is one the best powers banks, most highly rated by Amazon users, and rightly so! The battery capacity, efficiency, and size of this battery bank do justice to its price and qualify well to be carried along your mobile devices. As the name suggests, this is one heavy-duty, heavy-built battery power bank with hefty battery capacity and device compatibility that surpasses all. Easy Acc Monster 20000 may not be as handy as other portable power banks but it certainly makes up for its weight and size in terms of battery capacity and charge speed. This power bank is ideally made to be taken along on camping and long road trips and airplane flights. Once fully recharged, it can last as long as a week all the while rejuvenating your mobile USB devices, including cameras, iPads, and tablets. Taking in view its size, price, and battery capacity, Aibocn Power Bank 10,000 performs considerably well. In addition to that, there are several other useful features to this battery unit as well. Apart from a few ignorable downsides, Aibocn Power Bank 10,000 is largely very useful. It can bring your phone and other devices that charge via USB to life within a matter of minutes and keep you well-connected to the world while out on the roll. Relatively new to the power bank game, Dulla has done an exceptional job with the M50000 portable power bank. The size, weight, and battery capacity are really competitive at the given price for anyone looking for easy portability and excellent performance from a power bank. All these amazing features justify why this power bank is particularly popular among Amazon users. Dulla M50000 is an ideally useful companion for your smartphones and will come in real handy when you’re running low on phone battery. Vinsic is the go-to brand if you’re looking for a power bank top-notch in style, form, and function. The power bank offers great battery capacity, portability, a sleek design, and high performance, all at a very competitive price. Highly compatible with all Apple and Android devices. Additionally, works well with digital cameras, gaming consoles, MP3/MP4 players, etc. In terms of capacity to price ratio, Vinsic is an excellent-value power bank which has been mindfully designed. It’s an ideal companion for smartphones and tablet owners who won’t be in close vicinity of a mains power for quite some days. Powerful, stabilized, and stylish! This is precisely what you will have to say about RAV Power 16750 after you’ve used it a couple of times on your travels or days away from home. You have our word. This powerful unit from RAVPower works as well as advertised apart from the minor USB ports design flaw. That, however, won’t come in the way while you are out on an excursion and need to recharge your smartphones and tablets on the roll! 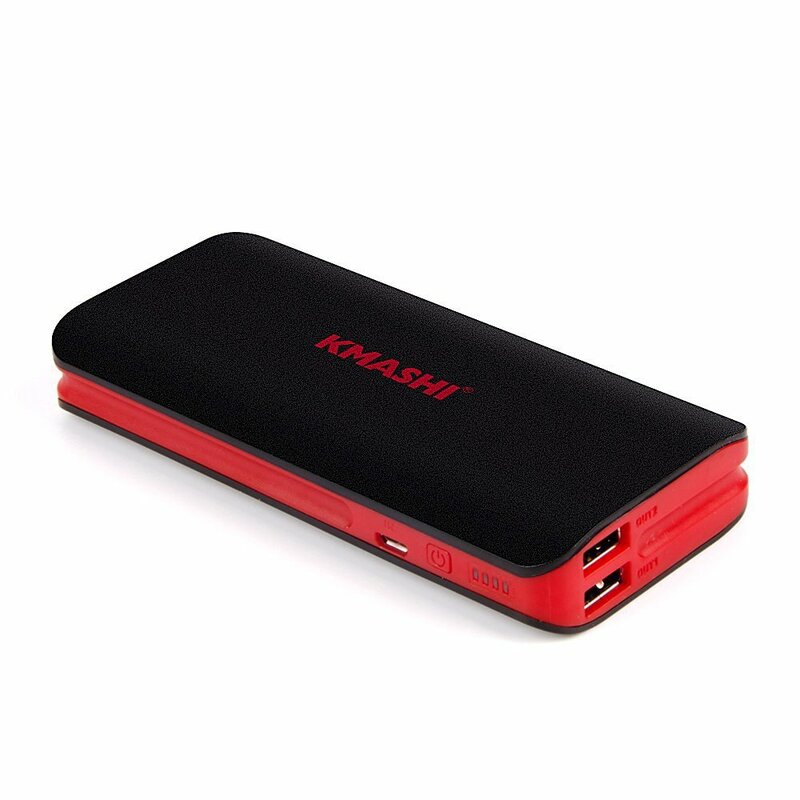 Kmashi has produced a rather amazing unit with the most advanced tech and portable design power banks have to offer. This sturdy external battery is able to hold the advertised potential and deliver it efficiently whenever required. If you’re in the search of a power bank that’s heavy duty both build and performance wise, KMASHI 10000 is just the power bank for you! Unifun 10400 may not be the slimmest power bank there is out there, but it certainly offers a great deal in terms of battery capacity and fast charging. This solid-build power bank works great with Go-Pro, digital cameras, smartphones, tablets, and almost anything that charges via USB. This portable alternative to a wall power outlet can definitely take a hit and continue to deliver in rugged environments and harsh weather conditions. The water proof and shock resistant outer casing is what sets this unit apart from others in the market. Anker is a trusted and reliable producer of power banks. Hence, goes without saying, PowerCore+ is a high-performing, battery bank encased in a comfortably small and an elegantly portable body. Anker’s lipstick sized PowerCore+ has to be the most powerful mini power banks available in the market. The elegant build and high performance of the battery make it quintessential for regular outdoor use and raise the bar for the power bank industry. RAV Power has quite outdone itself with this particular portable charger. High performing, chic in design, and pocketable solid build, this unit lives up to all the expectations users and RAV Power associated with it. RAV Power’s 22000 mAh portable charge is highly recommended for its consistency, quality performance, and durability. Take it along while on the go and you keep your smartphones and other mobile devices up and running at all times. This portable power bank has some great features packed inside a mini slick body. iXCC has produced this unit as a smart and compact solution to all your smartphones battery life issues. This power bank can certainly be relied upon for long travels and outdoor trips when you can’t get hold of a wall power outlet. When faced with so many brilliant options, deciding what power bank to buy can be quite an ordeal. However, the power bank market has a lot to offer if you know what you’re looking at and what you’re looking for. Here’s what you must consider to make an informed choice and purchase only the best power banks for your mobile devices. Not even the best power banks are 100% efficient. The standard power efficiency for battery banks is about 60%-70%. However, some do deliver up to 90% of the battery juice. Look or test for the power efficiency before making the purchase. It’s better to invest in the more advanced powerbanks that support Quick Charge3.0 and USB-C standards if your smartphones too are acquainted with aforementioned tech. Power IQ or other similar technologies ensure safety as well as fast charging simultaneously. Auto-on and auto-off is another extremely valuable feature of power banks. Pass-through charging is a sought after feature in power banks, which usually works by prioritizing the connected device and directing only the spare power to the battery bank. Design and a sturdy, compact build is a major player when purchasing a power bank. Always opt for the smallest unit at the same capacity. There are power banks that come with water proof, shock-resistant, and matte finish outer casings. These are more durable and heavy-duty options than others in the market. Typically, nearly all power banks come with 4 LED battery status indicators. However, if you wish to get the exact readout of the remaining battery, pick one with a built-in LCD screen. LED torch/flashlight is increasingly being added to power banks. It can come in handy in certain situations, such as camping. The input rating on the power bank determines how fast it charges therefore you’d want one with the higher Amps. If a power bank has multiple outputs then the maximum total output determines how fast and efficiently each USB port delivers. We all want to extend our smartphones’ battery life to the maximum possible and power banks are as close as it gets to this rather unreal aspiration. Before heading out shopping for power banks, ask yourself what do you need most of all the features mentioned above and make the choice accordingly. The products reviewed in this article are the cream of the crop, however still you may find one power bank more fitting than another depending on your preferences and requirements. If you’re looking for a battery bank with massive battery capacity and multiple Output USB ports, EasyAcc Monster 20000 mAh Power Bank is undoubtedly the perfect fit for you. If you value portability above all, the candy-bar sized Anker Astro E1 offers the highest battery capacity among other power banks with comparable sizes. However, we find ourselves increasingly inclined towards Anker PowerCore 20100. It stands out among all others for its amazing battery capacity, portability, unit design, integration of the latest technologies, and competitive price. It is one of the best power banks out there and also among the highest rated ones on Amazon; Anker PowerCore 20100 keeps your smartphones and all other devices that charge via USB very well-functioning for an ample time period. What do you think about our power banks review? Do let us know in the comments.